Steve Sande and I have been collaborating on "Talking to Siri," an ebook that just recently hit the Kindle store. It's a how-to that will help you get the most done with your Siri intelligent assistant. We're sharing some of our favorite tips with TUAW readers. 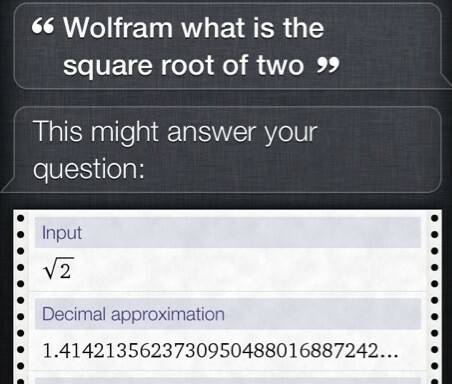 Today, we're looking at Siri's Wolfram Alpha integration. 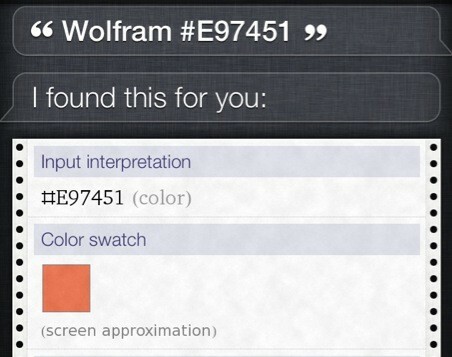 You can force Siri to use Wolfram by prefixing your request with "Wolfram." For example, you might say, "Wolfram, what is the square root of 2?" or "Wolfram, graph x-squared plus three." But there's a lot more that you can do with Wolfram than just math. Here are ten of our favorite Wolfram searches. These highlight the flexibility of this amazing information resource. Roll a Random Number. Say "Wolfram, random integer." Wolfram returns a random value between 0 and 1000. "Wolfram, random number" provides a 0 to 1 floating point value. Look up nature facts. Say, "Wolfram, what is the scientific name of a mountain lion?" It's Puma concolor. Rabbits are Leporidae, and Peacocks, Galliformes. Check upcoming holidays. Say, "How many days until Thanksgiving?" This returns both the number of days as well as a helpful calendar so you can chart out the time until then. Create a secure password. Say "Wolfram, password." Wolfram generates a difficult-to-crack 8-character password. Scroll down for alternates. If you need a longer password, you can append these together. Convert text to Morse code. Say, "What is Morse code for horsefeathers?" You'll see the entire sequence laid out for your tapping pleasure. Check your diet. Say, "How many calories in a small apple?" Wolfram will tell you that there are 75. Ask out about time zones. Say, "Wolfram, what is the local time in Jakarta?" Query about your chances. Say, "Wolfram, what is the probability of a full house?" For a random five-card hand, it's apparently 1 in 694. Have fun with pop culture. Say, "What is the airspeed velocity of an unladen swallow?" or "Wolfram, who shot the sheriff?" Visualize colors. Okay, I've saved the best for last. If you work with colors, this can save you a lot of time. Say, "Wolfram pound sign E 9 7 4 5 1" (for Burnt Sienna / Tangerine) or "Wolfram pound sign 2 9 A B 8 7" (for Jungle Green). This will also convert the colors to RGB values and look up closely-matching brand colors from Benjamin Moore. Make sure to scroll down to catch all the helpful information. 10 cool things you can do with Wolfram Alpha and Siri originally appeared on TUAW - The Unofficial Apple Weblog on Fri, 28 Oct 2011 15:00:00 EST. Please see our terms for use of feeds.